Whether you have just bought your first ATV or you're a seasoned rider, keeping your ATV maintained should be at the front of your mind. 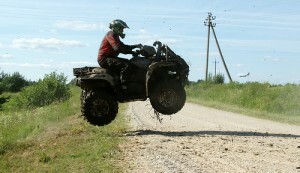 Cardey4everoil has some basic tips to share to get you on your way to a well maintained ATV. Remember that your levers are the primary way you control your ride, so pay them attention. Start by tightening your levers against the bar of your ATV and make sure they don't slip when you use them. When it comes to your gears, set the clutch how you feel comfortable riding. A good place to start would be allowing the clutch to move a little when you first grab it, to be sure you aren't engaging the clutch unnecessarily. This one changes depending on your planned ride, so it's a good idea to keep it in mind before each ride. Riding your tires too low can result in sluggish handling and present a danger if you aren't able to maneuver when you need to. Check your users manual for the recommended tire pressure for each type of condition and sort it out before you leave for the trail. Keeping the right levels of oil and fluids is the best way to prevent your engine from incurring unnecessary damage and seizing up during a ride. Your manual will have the information showing you where your oil should go and how to to check its levels, but a good place to start is by utilizing a purpose designed ATV oil. If you notice your levels are a little low, top them up before you head off. Don't get stuck mid-ride with an ATV that won't move. Change the oil as often as you want, but put a cheap oil filter in your ATV and your efforts could be for naught. Dirty oil contains grit that increases friction, wears on your engine, and decreases power. The oil filter captures these particles and keeps your oil clean. Follow these guidelines for choosing the right oil filter for your ATV. The industry standard for rating an oil filter is the micron rating. It measures how many particles of grit the filter can capture. Cheaper oil filters use cellulose fibers, and the gaps in these can allow a 20-micron grit particle to flow into your ATV's engine. Oil filters with synthetic fibers, on the other hand, trap more effectively and can hold more particles than other filters. To protect your engine and improve performance, go with a synthetic filter. If your ATV's oil filter is exposed, get a filter with a tough, thick, steel casing. A flying rock or other projectile could puncture a weaker filter, starting a fire or even destroying your engine. Protect yourself from such a scenario with a sturdy filter canister. Synthetic oil is more efficient than conventional oil. Its molecules are smaller and lighter, requiring less energy to mobilize. They are also more uniform, so they lubricate better. Improved lubricant flow diminishes engine wear, improves performance, and increases fuel mileage. Combine a synthetic oil with a synthetic oil filter for best results in your ATV. Keeping your ATV in good working order doesn't take much, it just takes the right products and upkeep. Speak with an expert at Cardey4everoil on (612) 991-4737 about Amsoil Oil in Pine City and the benefits it can easily provide your ride.